So, to be perfectly honest, there aren't really any interesting day or week celebrations to inform you of today. 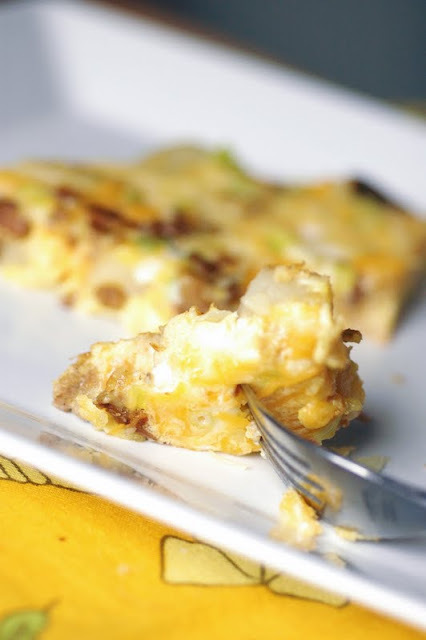 Instead, I thought I'd share a recipe the hubs and I recently tried for breakfast that we love! 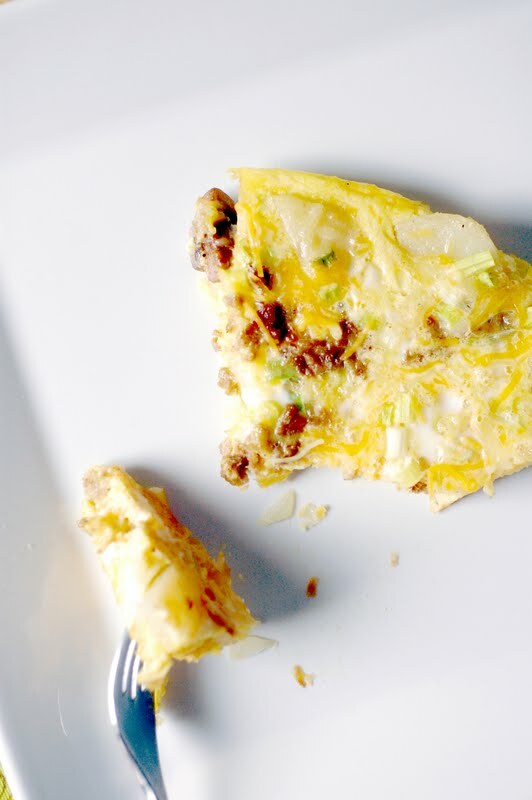 I saw Ina Garten make it on her show earlier this week, and it's an omelet dish inspired by her and Jeffrey's favorite breakfast place in France. I had to make a couple tweaks here and there to make it vegetarian, but it still turned out divine. And I got to use our new All-Clad pan (thanks mom and dad)! Cut the bacon crosswise in 1-inch slices. Cook the bacon in an 8-inch ovenproof saute pan over medium-low heat for 5 to 7 minutes, stirring occasionally, until browned. Drain the bacon on paper towels and discard the fat from the pan. *If you're going the vegetarian route, I sauteed (in olive oil) about a cup and a half of quartered mushrooms instead of the bacon, cooking them until they were limp and brown. Then I microwaved a couple of the veggie sausage patties and chopped/crumbled them onto a plate. Then I proceeded to the next step. Add the butter to the pan, and then add the potato and yellow onion. Cook over medium-low heat for about 10 minutes, tossing occasionally, until the onion starts to brown and the potato is tender but firm. Add the jalapeno pepper and cook for 30 seconds. Meanwhile, in a medium bowl, beat the eggs, milk, salt and pepper together with a fork. Stir in the scallions and diced Cheddar. When the potato is cooked, add the bacon (or veg sausage and mushrooms) to the pan and pour over the egg mixture. Place the pan in the oven for 15 to 20 minutes, until the omelet puffs and the eggs are almost cooked in the center. Sprinkle with a handful of grated Cheddar and bake for another minute. Serve hot directly from the pan. Happy National Thrift Shop Day!!!!! !